PRIME Minister Datuk Seri Najib TunRazak has urged property players to give more emphasis to the identity, function and sustainability of their projects to make Malaysia a preferred destination for real estate. 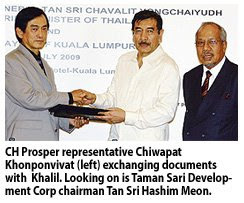 He said the reputation of local properties for quality should be reinforced through promoting a Malaysian identity. "We should not have a skyline which is indistinguishable from any other city in the world," he said at the official launch of the Malaysia Property Incorporated (MPI) in Kuala Lumpur today. "We are proud that our iconic buildings like the Petronas Twin Towers and Menara Dayabumi have Malaysian and Asian aesthetics," he said in his speech which was read by Minister in the Prime Minister’s Department Tan Sri Nor Mohamed Yakcop. Najib said Malaysian properties should be truly functional to meet the needs of its users while understanding and taking into account, local factors such as weather and the culture. "A focus on function means that a property should not be just a physical structure of brick and mortar but one which truly supports the activities and lifestyle of its users. "At the same time, it must be well integrated into the surrounding community," he added. When it comes to sustainability, he said the government was focused on promoting the use of green technology, which also includes encouraging the development of energy efficient buildings. Sunrise Berhad’s Executive Deputy Chairman, Datuk Allan Lim (centre) and AGM Development, Raymond Cheah accepting the first of two 5-star awards bestowed onto two Sunrise condominiums. KUALA LUMPUR: Sunrise Bhd's two condominiums won two "5-Star" awards in the recent Asia Pacific Property Awards 2009 held in Singapore. The company said on July 24 that 10 Mont'Kiara won in the category for "Best High Rise Architecture in Malaysia" and 11 Mont'Kiara for "Best High Rise Development in Malaysia". A '5-Star' rating reflects the top honour in each category. The awards were presented at at the Marina Mandarin, Singapore on July 16. 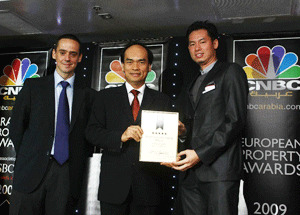 The awards were held in association with CNBC Arabia Television. Sunrise assistant general manager for development, Raymond Cheah said: "We are ecstatic to have been awarded the highest honour in such a prestigious competition." "The results bear testament to the passion we put into what we do and our promise to deliver our best to exceed customers' expectations', he added. Cheah said the awards would encourage the company to come out with more innovative ideas to deliver new experiences, where product quality, state-of-the-art designs and service excellence are the key differentiators. The bungalow-in-the-sky twin-tower 10 Mont'Kiara has 332 units with sizes ranging from 3,478 sq ft to 4,090 sq ft and sprawling penthouse units of over 7,500 sq ft. The iconic Green Mark certified 11 Mont'Kiara presents five uniquely sculptured curvilinear towers with 339 units, each enjoying a grand 270º view. With one or two private abodes per floor, unit sizes start from 2,700 sq ft with a choice of eight unique designs. Limited units in both condominiums, located next to each other at Jalan Kiara 1, are available for sale, it added. KUALA LUMPUR: Al-Hadharah Boustead Real Estate Investment Trust (REIT) recorded a net profit of RM16.57mil for the second quarter ended June 30, an increase of 1.5% from RM16.33mil in the previous corresponding period, boosted by a gain of RM6.5mil on the compulsory acquisition of investment property by the Government. Revenue rose 1.7% to RM17.8mil for the second quarter from RM17.5mil previously. For the six months to June 30, the group posted a slightly higher net profit of RM36.81mil against RM33.65mil before. Total revenue, however, was lower at RM33.61mil compared with RM36.3mil in the same period last year. In a statement, the company attributed the decline in revenue to lower performance-based rental which was a result of lower crude palm oil prices. The unit price of the fund for the quarter gained 13 sen to close to RM1.17 as at June 30 from RM1.04 recorded on March 31. As at July 22, the unit price was at RM1.23. The fund will distribute a dividend of 3.69 sen to unitholders, to be paid on Aug 28. QUILL Capita Trust, a commercial real estate investment trust, reported a 19.8 per cent increase in net profit for the second quarter ended June 30 2009, with income contribution from 10 assets compared with 9 previously. It posted RM8.09 milion in net profit for the quarter from RM6.75 million a year ago. Revenue rose 21.1 per cent to RM16.67 million from RM13.69 million in the second quarter of 2008. QCT will distribute 3.78 sen per unit for the six months period, up 12.5 per cent from last year. The Malay Contractors Association is seeking a nationwide grant for research to make the industry more competitive. Its president Senator Datuk Roslan Awang Chik has proposed that each state receives between RM500,000 and RM1 million for administrative purposes. The administration of the contractors will depend on the income generated from the projects received. "If a grant is given, it would be used for administrative purposes. This way our focus won't be so much on seeking and waiting for projects, but more on looking for ideas for the betterment of the industry," he said after launching the association's 33rd annual general meeting in Kuala Terengganu yesterday. Also present was the state's association president and Kuala Nerus Member of Parliament, Datuk Mohd Nasir Ibrahim Fikri. Roslan said the country needs a new breed of contractors who are knowledgeable in several aspects, including management, administration and building techniques. This is vital in line with the changes in the industry, such as the emergence of new technologies and higher costs of building materials. "We need contractors who thirst for knowledge and not sit just around waiting for government contracts," Roslan said. However, he added, not many contractors want to learn new things from the Internet and seminars and lack of information can lead to emotion-based decisions.